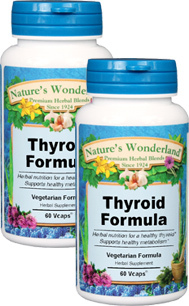 Thyroid Formula - 625 mg, 60 Vcaps™ each (Nature's Wonderland) - Penn Herb Co. Ltd. Your thyroid glands control how quickly the body burns calories, how it uses energy and even regulate the body's temperature. THYROID FORMULA is a one-stop source of herbal nutrients for rejuvenating thyroid function. Tune-up Your Thyroid For Higher Metabolism & Energy. Iceland Moss, Irish Moss, Kelp, Parsley Leaves, Water Cress; Plant Cellulose (Vcaps™) - vegetarian capsules. As an addition to the daily diet, take 1 or 2 capsules 3 times daily with water at mealtimes. NOTE: Not recommended for use if you have hyperthyroidism.